Marco, the main character in And to Think I Saw it on Mulberry Street, has the kind of imagination we hope every child will develop. And to Think I Saw it on Mulberry Street is the latest release from Oceanhouse Media. Before leaving for school everyday Marco’s Dad tells him “keep your eyelids up and see what you can see” so that he may share with his Dad, after school, all of the interesting things he sees. As Marco nears home his tale has grown more much more exciting than the old, boring horse and wagon, which was the only thing he actually had seen. Which version of the story will Marco tell his Dad? 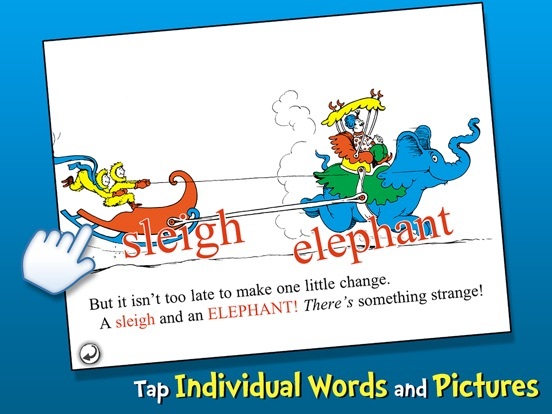 I grew up loving anything Dr. Seuss and I was not disappointed with this storybook app. 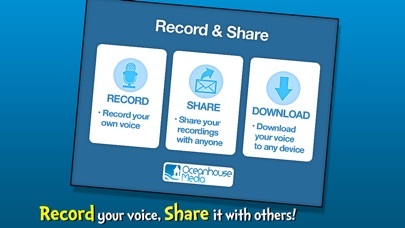 The storyline, graphics, colors, narration and user interface are very well done. 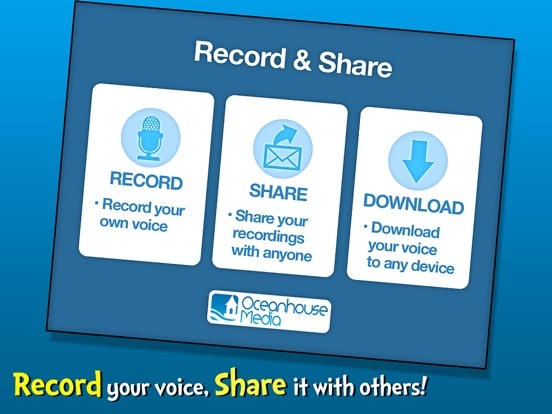 Two things I would like for the developers to change are the location of buttons that would take the child outside of the app, buttons for additional Seuss apps and connecting with Oceanhouse Media; place them under the information button and then consider implementing some sort of mechanism that would prevent a child from accessing them, such as pressing and holding the button for a few seconds. As is common in most book apps these days, there are three ways to enjoy the story; Read to Me, Read it Myself and Auto Play. The Auto Play is more movie than traditional book. I’m not crazy about the method used for exiting the Auto Play; using the home button to exit the app and then you need to re-enter the app, if you want to continue with another option. I’d prefer a button similar to what the other two reading options contain. If the concern is the child pressing it, again consider adding a feature where you would need to hold the button down for a few seconds. The Read to Me and Auto Play have words being highlighted as the text is read. 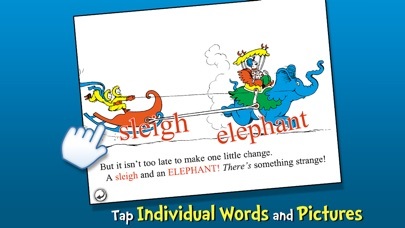 This is a desirable feature for early readers. In the Read to Me and Read it Myself the child can touch the words to hear them spoken and are able to touch the pictures to see and hear the word. These are fantastic features for building word association. And to Think I Saw it on Mulberry Street is a universal app that works well on either device. You will not be disappointed with And to Think I Saw it on Mulberry Street. It is very well done and reasonably priced. 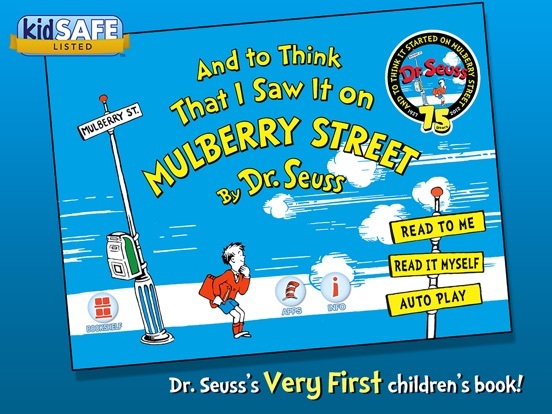 Dr. Seuss’s first children’s book, “And to Think That I Saw it on Mulberry Street,” instantly captivated parents and children when it arrived in bookstores in 1937. 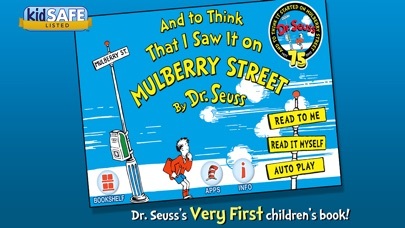 Now 75 years later you can enjoy this pivotal story as an interactive omBook! Marco walks to school along Mulberry Street keeping his eyes peeled for interesting sites to share with his dad. 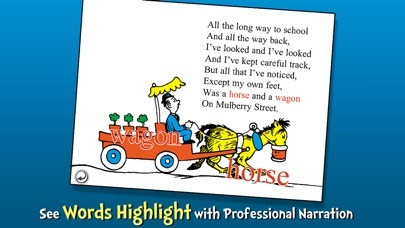 But today all he sees is a boring old horse and wagon. “That’s nothing to tell of, that won’t do, of course”. . . so Marco envisions much more exciting events, each more elaborate than the last. 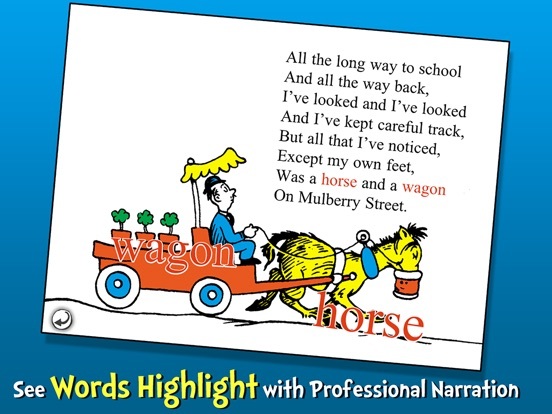 The horse and wagon turn into a zebra and charioteer, then to an elephant with a sleigh as Marco’s imagination goes on a wild ride down Mulberry Street. “But now I don’t know . . .
Would whip it around in the air like a kite.